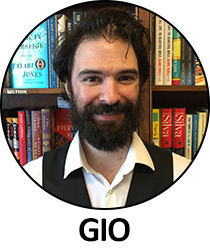 Giovanni is a fan of the literary classics, but also a constant reader of darker, more sinister fiction. As long as it has a good story and compelling characters, he's in! Comments: Set in the 2700's on Mars, the people of Earth have been eradicated, humanity nearly extinct. The survivors live in cities and colonies throughout the Solar System. Nathan Bright is the weatherman for Redd Bay, on Mars. He is obnoxious, self-centered, and doesn't take anything seriously. And yet, he is blamed for the death of 18 billion men, women and children, the population of Earth. Brutal, fast-paced and bloody, this series has a lot more intellectual depth than one might think. What would you do to the person who took away your loved ones? How far would you go for revenge? Would it make you feel better? Would it make you as bad as them? Worse? What if the person responsible was gone and replaced by someone else, someone with no knowledge of committing such atrocities? Exploring morality, identity and responsibility, Weatherman promises to be a thrilling new series in the Graphic Arts world. Welcome back to Daevabad! Five years have passed since the conclusion in City of Brass. Nahri is married and her skills and magic have much improved. Ali has built a life for himself in a small village in the outskirts of his tribe's homeland. Though life seems to have taken a turn for the better, things are quickly turned upside down when Ali is forced to return to Daevabad and his family. Nahri continues to struggle for independence, continuously butting heads with Ghassan. As the Generation Celebration draws near, a celebration held once every 100 years, what should be a joyous time is marked with tragedy. As much about family as it is about identity and loyalty, the Deavabad Trilogy continues to bring magic to life. Where to begin? A fast paced Middle Eastern fantasy novel that takes off from the very beginning. Nahri grew up on the streets of 18th century Cairo during the Ottoman empire and trying to make a living as a con artist and grifter during the French Occupation. As if life wasn't difficult enough, she accidentally summons a centuries-old Daeva warrior from Djinn legend and attracts the attention of very dangerous Ifrit. Things go from bad to worse when she is brought to the ancient Djinn city of Daevabad and thrown into court politics. And to top it all off, she's likely the sole surviving member of one of their races' most powerful and influential families. One that was nearly exterminated by the ancestors of the current ruling king. Hooked yet? The first in a new trilogy, this will certainly be a fresh and lasting addition to an already vast genre. Huggie is a stuffed rabbit that has seen better days. Stick is a rather upbeat twig figure. Together, they go on an epic adventure around the world encountering all kinds of people and animals. While things don't go over smoothly for Huggie, Stick has the time of his life. A hilarious adventure story of an unlikely pair that will appeal to kids and parents alike. This dark dystopian novel is a great, quick read for anyone who loves a good story. It follows three primary characters; Mira, a shadow-trader feeding the shade of birds and animals to her mother, who lost her shadow, Murk, the half-mad one-legged junkie who sips his own shadow to get high, and Bale, an exiled citizen from the dome cities, who must learn how to survive in this world of shadow addicts and revolutionaries. A compelling story about fear, hunger and sacrifice, but also loyalty and determination. Fans of Viking Sagas rejoice! This debut novel is fast-paced action, political intrigue and thrilling adventure all in one. Follow young Ragnvald as he grows from a young raider to advisor to kings and great warrior. His young sister Svanhild is equally fierce, often over-stepping the traditional women's role and facing down fearsome warriors, waging a war of her own in the home and the heart rather than upon ships or battlefields. These headstrong siblings descend from kings and appears that kings will once again live through their line. Reader beware: This is the first installment of what promises to be a MIGHTY trilogy. The ending wil only make you crave more! Have you ever put on a record and then debated which mixed drink would go great with the smooth music of Jazz or the heavy beats of hair metal? It's a common struggle, finding just the right cocktail to suit your musical mood. Well fret no more! This book lists some of the best albums across a myriad of genres and pairs them with choices for classy cocktails. Whether you're relaxing with Coltrane after a long work week, or hosting a party with Aerosmith, this book will have great suggestions on what to drink and what to serve while spinning some of the greatest music of all time! This is a beautiful collection of stories full of mysticism, magic and wit. These are tales about people, about love, about loneliness and loss. Each one is different, each one is sad and beautiful and magical. Read this book. You won't be disappointed. A wonderful Dystopian sci-fi novel, with DRAGONS! This book follows three teenagers as they navigate their way through a very old world, left almost entirely to the elements; overgrown estates, abandoned city blocks, a prison left to the prisoners and natives, all smoldering and smoking, all haunted by the shadows on the dragons above. Part coming-of-age tale, part glimpse into our potential future, this novel is a magical ride through a world both strange and familiar. Comments: When one thinks of Artificial Intelligence, one thinks of monotoned, emotionless machines with stiff movements and strict programmed responses. This isn't the case for the cast of characters of this book. Humans have been exterminated, extinct for three decades, but war still rages, battles are still fought, independence is still the ultimate dream. These robots are more human than we can imagine. They feel affection, remorse, regret, fear death and their own mortality and fight for their right to exist freely. This is not what one would expect of a science fiction novel based around robots, it is so much better! Brilliant. Witty. Engaging. This is a beautiful story of two, well, not people exactly. Milo is the oldest soul in the afterlife, having lived eight thousand years and nearly ten thousand lives, and has yet to reach Perfection. Suzie is Death. Milo and Suzie are in love, and have been for eight millenia, but this love affair is preventing Milo from reaching Perfection and throwing the Universe off balance, at their immortal peril. When you've loved someone for eight thousand years, it's hard to give that person, or anthropomorphised idea, up. This is a beautiful story about love, life(s) and human and not-quite-human failures. Joe Hill's Fireman is another prime exploration of what happens when people are faced with deadly challenges, how they fight, overcome or embrace what nature has thrown at them. As civilization as we know it slowly crumbles away to ash, we follow one young woman through, almost literally, Hell itself. She meets angels and demons of all sorts, but all ultimately human. We follow our heroine as she grows from a timid nurse and housewife to a fierce protector, learning to live with and harness her new affliction that has wiped out much of humanity. This is not for the faint of heart, but is richly rewarding when racing through the final climactic pages. Any fan of Neil Gaiman or Norse Myth and culture will love this book! First collected and transcribed by Icelandic poet and historian, Snori Sturlson, in the early 13th century, Gaiman has retold these classic tales with his own wit and magical imagination. Here is how the world was created, how the gods were born, their trials and tribulations, great adventures, and finally, their downfall and demise. RAGNAROK! These stories are beautiful, imaginative and highly entertaining. Stephen King has proven time and again to truly be the master of horror. His novels have kept readers up at nights for decades. He is also a master of the short story. In his newest collection, there are far fewer monsters in the shadows, but instead lurk behind human eyes. Not all of these stories are frightening, either. Here, he delves deep into the human psyche, exploring human nature and our reactions and responses to terrible situations. This is classic King, giving the reader background to each little gem, inviting you in with his personal address of Constant Reader, and locking the door behind you. Each story, and even a couple of poems, will pluck at your various emotions to play a beautiful heart-breaking melody. Enjoy! Ray Bradbury has been one of my favorite authors since I first read The Martian Chronicles in high school. With his disarmingly simple, yet elegant prose, he evokes nostalgia in every story. With From the Dust Returned, we are transported to a small town in Illinois to join a family that celebrates Halloween like Christmas, with a menagerie of goblins and ghouls, mostly harmless, but wickedly delightful. This collection of stories revolving around this unique family will be your next fall favorite read, perfect with a crackling fire and a howling wind!